Rascon, during his tenure as a major. Alfred (Velasquez) Rascon (born September 10, 1945) is a retired United States Army lieutenant colonel. In 2000, he was awarded the Medal of Honor—the United States' highest military decoration—for his actions as a medic near Long Khánh Province during the Vietnam War. On more than one occasion Rascon exposed himself to enemy fire and grenades by covering the bodies of those whom he was aiding with his own. In addition to Vietnam, Rascon also served as a medical officer in the wars in Afghanistan and Iraq. Rascon was born in Chihuahua, Mexico on September 10, 1942, as the only child of Alfredo and Andrea Rascon. The Rascon family, in search of a better way of life, emigrated to the United States. They settled in Oxnard, California, where Rascon received his primary and secondary education. On August 1963, he graduated from Oxnard High School and enlisted in the United States Army. Rascon received his Basic training in Fort Ord, California, and after completing he was assigned to Fort Sam Houston, Texas for basic and specialist medical training. After he graduated from his medical training, he volunteered for airborne training and attended the Army's Airborne school in Fort Benning, Georgia. In February 1964, Rascon was then assigned to Headquarters Company, Medical Platoon, 1st Battalion, 503rd Infantry (Airborne) of the 173rd Airborne Brigade (Separate) stationed in Okinawa. On May 1965, Rascon and his unit were deployed to the Republic of Vietnam where he served as a medic for a platoon of paratroopers. The brigade was the first major ground combat unit of the United States Army to serve there. They were the first to go into War Zone D to destroy enemy base camps and to introduce the use of small long-range patrols. On March 16, 1966, Rascon was assigned as a medic to a Reconnaissance Platoon of the 173d Airborne Brigade. The Reconnaissance Platoon's mission was to reinforce a sister battalion which was under intense enemy attack near Long Khánh Province, when it found itself under heavy fire from a numerically superior enemy force. Several point squad soldiers were wounded and Specialist Four Rascon made his way forward to aid his fallen comrades. In more than one occasion Rascon exposed himself to enemy fire and grenades by covering the bodies of those whom he was aiding and absorbing the blast and fragments of the grenades with his own body. Each time he would drag his comrades to safety and crawled back to aid someone else. Rascon was so badly wounded that day that he was given his last rites. Rascon was transferred to Johnson Army Hospital in Japan where he spent six months recovering from his wounds. For his actions, he was nominated for the Medal of Honor. However, his nomination for some unknown reason did not go through and instead he was awarded a Silver Star. In May 1966, he was honorably discharged from active duty and placed in the Army Reserves. Rascon attended college after he was discharged and in 1967 he became a Naturalized United States Citizen. In 1970 he graduated from the Army's Infantry Officers Candidate School and was commissioned as a Second Lieutenant of Infantry. He then returned to Vietnam for a second tour, this time as a military adviser. In 1976, Rascon was once again honorably discharged from active duty with the rank of Captain, but continued serving in the US Army Reserve until 1984. In 1976, Rascon was offered the position of U.S. Army military liaison officer, in the Republic of Panama and he accepted. Rascon has also worked for the Department of Justice's, Drug Enforcement Administration, INTERPOL (U.S. National Central Bureau), and the Immigration & Naturalization Service. During a 1985 reunion of the 173rd Airborne Brigade, Rascon's comrades discovered that he never received the Medal of Honor. His former platoon members Ray Compton, Neil Haffey and Larry Gibson, whose lives he saved, sought to correct the oversight and renewed their efforts in favor of a Medal of Honor for Rascon. The Pentagon would not reconsider Rascon's case because so much time had elapsed. Therefore, Rascon's comrades sought the help of Congressman Lane Evans from Illinois. In 1997, Evans gave President Bill Clinton a packet containing the information about Rascon. The President then convinced the Pentagon to reopen the case. 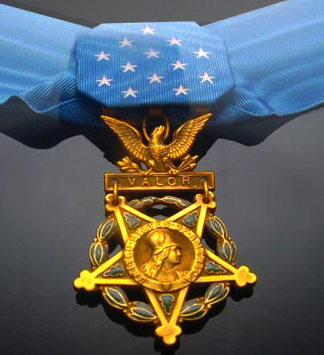 On February 8, 2000, President Bill Clinton bestowed upon Rascon the Medal of Honor in a ceremony held in the East Room of the White House. On May 22, 2002, Rascon was confirmed by the United States Senate as the 10th Director of the Selective Service System, he served in this position until 2003. On September 1, 2002, Rascon returned to the Army as an Army Reserve Major in the Army Medical Service Corps. His position was Individual Mobilization Augmentee to the Surgeon General's Office. Rascon served in Afghanistan and Iraq for the Medical Service Corps. He retired from the military with the rank of Lieutenant Colonel. Specialist Four Alfred Rascon, distinguished himself by a series of extraordinarily courageous acts on March 16, 1966, while assigned as a medic to the Reconnaissance Platoon, Headquarters Company, 1st Battalion (Airborne), 503rd Infantry, 173d Airborne Brigade (Separate). While moving to reinforce its sister battalion under intense enemy attack, the Reconnaissance Platoon came under heavy fire from a numerically superior enemy force. The intense enemy fire from crew-served weapons and grenades severely wounded several point squad soldiers. Specialist Rascon, ignoring directions to stay behind shelter until covering fire could be provided, made his way forward. He repeatedly tried to reach the severely wounded point machine-gunner laying on an open enemy trail, but was driven back each time by the withering fire. Disregarding his personal safety, he jumped to his feet, ignoring flying bullets and exploding grenades to reach his comrade. To protect him from further wounds, he intentionally placed his body between the soldier and enemy machine guns, sustaining numerous shrapnel injuries and a serious wound to the hip. Disregarding his serious wounds he dragged the larger soldier from the fire-raked trail. Hearing the second machine-gunner yell that he was running out of ammunition, Specialist Rascon, under heavy enemy fire crawled back to the wounded machine-gunner stripping him of his bandoleers of ammunition, giving them to the machine-gunner who continued his suppressive fire. Specialist Rascon fearing the abandoned machine gun, its ammunition and spare barrel could fall into enemy hands made his way to retrieve them. On the way, he was wounded in the face and torso by grenade fragments, but disregarded these wounds to recover the abandoned machine gun, ammunition and spare barrel items, enabling another soldier to provide added suppressive fire to the pinned-down squad. In searching for the wounded, he saw the point grenadier being wounded by small arms fire and grenades being thrown at him. Disregarding his own life and his numerous wounds, Specialist Rascon reached and covered him with his body absorbing the blasts from the exploding grenades, and saving the soldier's life, but sustaining additional wounds to his body. While making his way to the wounded point squad leader, grenades were hurled at the sergeant. Again, in complete disregard for his own life, he reached and covered the sergeant with his body, absorbing the full force of the grenade explosions. Once more Specialist Rascon was critically wounded by shrapnel, but disregarded his own wounds to continue to search and aid the wounded. Severely wounded, he remained on the battlefield, inspiring his fellow soldiers to continue the battle. After the enemy broke contact, he disregarded aid for himself, instead treating the wounded and directing their evacuation. Only after being placed on the evacuation helicopter did he allow aid to be given to him. Specialist Rascon's extraordinary valor in the face of deadly enemy fire, his heroism in rescuing the wounded, and his gallantry by repeatedly risking his own life for his fellow soldiers are in keeping with the highest traditions of military service and reflect great credit upon himself, his unit, and the United States Army. Rascon received the degree of Doctor of Medical Jurisprudence, Honoris Causa on May 17, 2003, from the Uniformed Services University of Health Sciences' (USUHS) F. Edward Hebert School of Medicine and Graduate School of Nursing. The Army has honored Rascon by renaming their training school for medics at Fort Campbell, Kentucky, the Alfred V. Rascon School of Combat Medicine. Rascon has been honored by the American Immigration Lawyers Association and Foundation in Washington, D.C., for his past contributions in the military. The Washington-based CATO Institute also honored him in its annual honors of past and present military contributors of Hispanic Americans. He resides in Laurel, Maryland and is married and has a daughter and a son. Army Commendation Medal with "V" Device and two bronze oak leaf clusters. ↑ 9.0 9.1 9.2 Hopkins, MC3 Jeff; Stelle, TSgt James (2007). "Medal of Honor recipient visits USU". Uniformed Services University of the Health Sciences. pp. 1–2. http://www.usuhs.mil/vpe/enews/newsed29.pdf. Retrieved 3 February 2013. Wikimedia Commons has media related to Alfred Rascon. "Power Point Presentation". http://webcache.googleusercontent.com/search?q=cache:DbpBGwYwza4J:https://www.1888932-2946.ws/vetscommission/e-documentmanager/gallery/Documents/July_2006/IOMUpdate.pdf+Alfred+V.+Rascon&hl=en&gl=us&ct=clnk&cd=20&ie=UTF-8. Retrieved September 24, 2010. "Medal of Honor recipient speaks at Fort Detrick". http://www.dcmilitary.com/stories/041008/standard_28234.shtml. Retrieved September 24, 2010. "MOH recipient speaks to students". http://www.usuhs.mil/vpe/enews/newsed29.pdf. Retrieved September 24, 2010. "Interview at the Pritzker Military Library". http://www.pritzkermilitarylibrary.org/events/2010/06-10-alfred-rascon.jsp. Retrieved September 24, 2010.